Create a detailed description of your invention. This description should include prose, specifications, drawings and graphs describing your invention in such detail that a skilled practitioner could use your description to manufacture it himself. Draft patent claims for your invention. These claims should describe which specific features of your invention (such as a collapsible frame) warrant patent protection. Your claims must establish that your invention, and every feature of it that you seek to patent, is unique, useful and inventive. 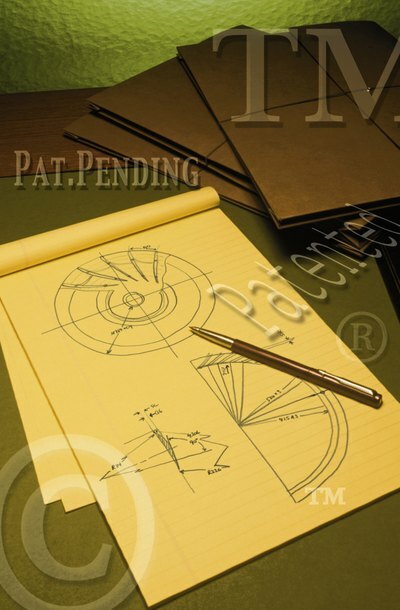 Write an abstract for your patent application. The abstract should be 150 words or less and should state succinctly what your invention is, what it does and how its main components work. Create digital copies of your descriptions, claims and abstract. Navigate to the USPTO website and register with the Electronic Filing System (EFS-Web) on the "Getting Started – New Users" page. Obtain a customer number and digital certificate. Registration allows you to track the status of your patent application online and electronically save your patent application materials on the USPTO website. Complete the Application Transmittal form, which is a cover sheet for your application. It requires you to supply basic facts about your application along with your mailing address. Complete the Fee Transmittal form. This form is used to calculate the applicable fees. Complete a Declaration for Utility or Design Patent Application form. You must list your name and contact details; the name, contact details and citizenship of each inventor; provide information about any foreign patent applications that may have been filed with respect to this invention; and declare that you believe the listed inventors are the first inventors of the technology you seek to patent. Prepare an Application Data Sheet. Follow the instructions provided in the format guide issued by the USPTO. This document requires you to supply bibliographic information about yourself and to list previously filed patent applications, if any, with respect to the invention. Submit the Application Transmittal and the Fee Transmittal form, the Declaration for Utility or Design Patent Application, the Application Data Sheet, and your description, claims and abstract to the USPTO using the EFS-Web filing system. Pay the application filing fee, which will be several hundred dollars. You can remit your payment online by credit or debit card, via electronic funds transfer (EFT) or from a USPTO deposit account. Respond to any correspondence you receive from the USPTO. It is normal to receive multiple requests for clarifications as well as demands for revisions to your application. If you disagree with the USPTO, submit a detailed explanation of your argument and reasoning. Pay the patent issuance fee once you are notified that your patent has been approved. Fees vary but you can expect to pay at least several hundred dollars for the patent issuance fee. U.S. Patent and Trademark Office: How Much Does It Cost to Get a Patent?